The limousine in a deadly crash that killed 20 people in upstate New York on Saturday had failed inspection last month and the driver didn't have the appropriate license to operate the vehicle, Gov. Andrew Cuomo revealed Monday. ALBANY -- The limousine in a deadly crash that killed 20 people in upstate New York on Saturday had failed inspection last month and the driver didn't have the appropriate license to operate the vehicle, Gov. Andrew Cuomo revealed Monday. Cuomo said the limousine was owned by Prestige Limousine in the Albany area, but didn't have the necessary federal certification to operate and failed a state inspection just last month. The revelations come as authorities continue to investigate the deadly crash that killed 17 passengers, the driver and two pedestrians in the rural town of Schoharie. The driver, according to media reports, was identified as Scott Lisinicchia. There has been no immediate comment from the limousine company. 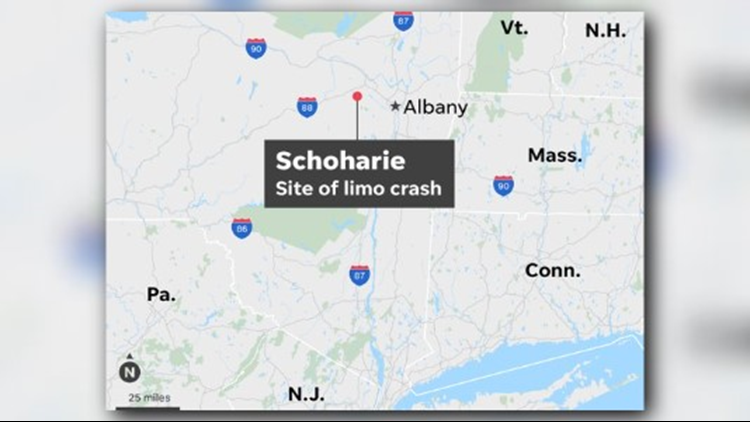 There has been no immediate comment from the limousine company, which is based in Gansevoort, Saratoga County, records showed. He explained the SUV was what they call "chopped vehicle, which is what this limousine was. This was a Ford that was cut and extended." Meanwhile, an on-site inspection by the state in September also showed the vehicle was not safe for the road, he said, because it failed the inspection. Cuomo said it was too soon to know if speed was a factor or if the crash was the result of a mechanical failure.